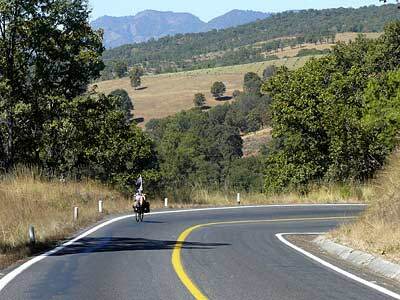 On Sunday, January 25, we resumed our cycling route from Uruapan back, eventually, to Morelia, where we started. On this first day, we rode to Angahuan, in the mountains. We expected it to be hard work, and it was. We climbed almost 1000 meters  around 3000 feet  in a 35 kilometer ride, and there were a few descents along the way, lost elevation that had to be regained, so it was a a lot of climbing. Also, we were at around 5,200 feet when we started, around 8,000 feet at the end, so we could feel the altitude. 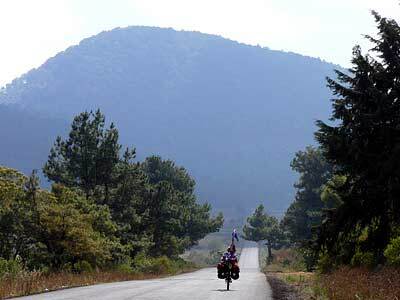 It took us four hours of cycling to do the 35 kilometers  that is slow going! 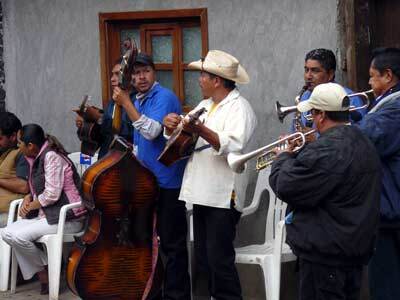 Angahuan is a village of Purepecha Indians  you hear very little Spanish here  and it is different from anywhere else that we have ever been. I don't know exactly what either of us expected of Angahuan, but whatever it was, we were disappointed in some ways. One strong impression upon entering town, besides the extreme difficulty of riding on rough cobblestones and muddy roads, was poverty. Mangy horses, muddy or cobbled lanes, run-down buildings. 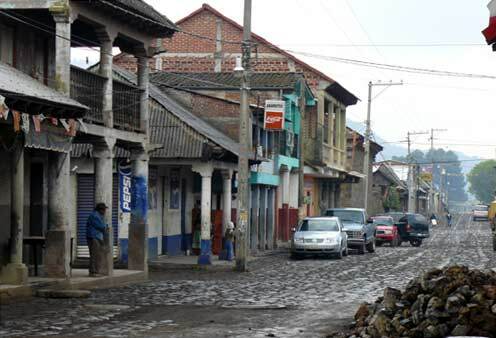 (Right: the main street in downtown Angahuan) I thought that perhaps the Indians of Mexico are in a similar position to that of many blacks in the U.S.  that is, victims of generations of discrimination and therefore afflicted by poverty and other social problems more than the population at large. In any event, poverty was our first impression. On the other hand, many of the women of the town dressed in traditional costumes, and they were gorgeous. Woven shawls, and aprons of bright velvet materials embroidered with all sorts of colorful patterns. (We'd heard that traditional Indian people don't like to have their pictures taken, and we were shy about asking, so we didn't get good photos to show these costumes.) Kids that we saw in the market in the morning were smartly dressed for school. 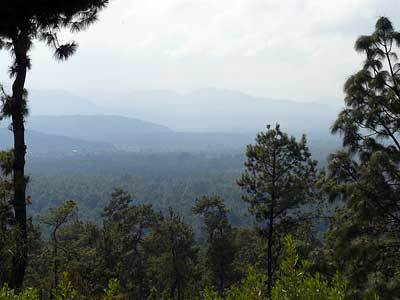 The clothing, the persistence of the Purepecha language, and the crafts for which many of these Indian villages are noted, all seem to suggest that there's a powerful culture here  but it's certainly foreign to us. 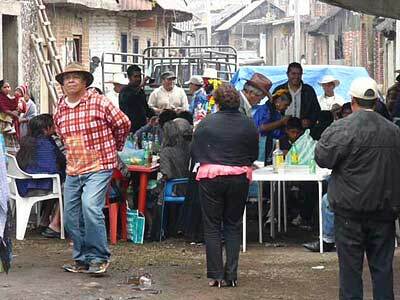 All day and much of the evening, there were voices broadcast over loudspeakers throughout the village  what sounded like chants, spoken words, for sure, but in phrases that ended on a prolonged note, always on the same pitch. It made us think of muezzins in Muslim countries, but we had no idea if the constant chants had any religious or cultural significance. Perhaps they were just ads for a new restaurant or for tourist attractions! Whatever the explanation, the atmosphere was decidedly strange to us, unlike anything we've experienced in Mexico or anywhere else, for that matter. 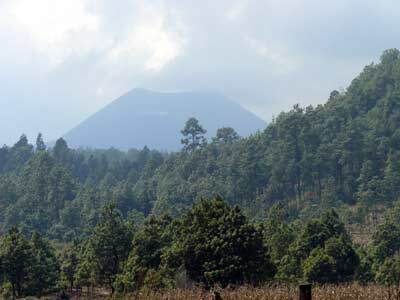 The big attraction of Angahuan is the nearby volcano, Paricutin, the youngest volcano in the world. You can ride to the volcano on one of the pathetic local horses, with a guide. Also, from a mirador outside the village you can see a cathedral poking up from the lava fields that engulfed the nearby town of Paricutin when the volcano erupted in 1943. Unfortunately the air continued to be hazy so our views were not good, and we had no intention of victimizing two of the sad horses in order to get closer. The accommodation we stayed in was surprisingly good, Los Cuartos Familares, large, clean, simple rooms with fireplaces that we used with pleasure. Hot water for showers came from a wood-fired boiler that was lit in the afternoon for us. There was also a restaurant on the premises that served us a good, cheap meal. So we left with mixed feelings about Angahuan, but we knew that we did not want to stay another day. Therefore we set out in the morning for our next destination, the town of Tinguindin. The ride to Tinguindin began with a little more climbing, but after a few kilometers, still somewhere around 8,000 feet, we began a descent that must have lasted close to an hour, just amazing. We dropped nearly 3,000 feet. Yes, those are clouds below us in the photo, as the descent begins. 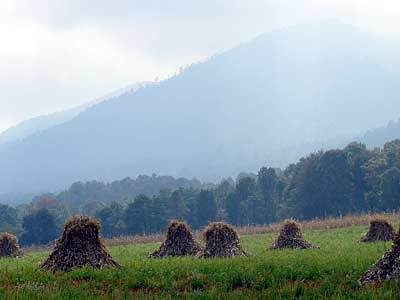 In the valley, the city of Los Reyes was crowded and unattractive, though there may have been nice parts. From there to Tinguindin, there was more climbing on a fairly busy highway, and it grew warmer and warmer. When we reached Tinguindin by mid-afternoon, we were pleasantly surprised. Going by on the main road, the place didn't appeal at all, but just a few blocks off the highway was an unusually pretty square and a distinguished church. There were white, wrought-iron benches in the plaza and here and there in other pedestrian lanes, and a beautiful little hotel on a side street. 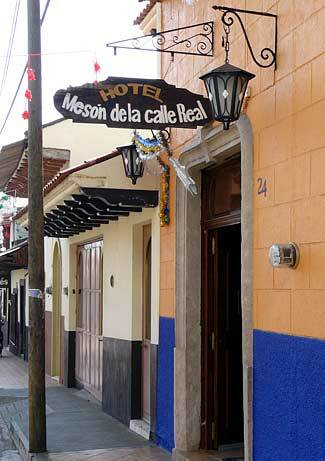 Hotel Meson de la Calle Real had some classy rooms with king-sized beds that were relatively expensive. Ours was a smaller room, only one double bed, but also clean, carpeted, with cable TV and very attractive, and again only 300 pesos (about $23.) We ate huge tortas in a nice little restaurant nearby, so generous that we abandoned the idea of dinner. The town was appealing, and we thought of staying over an extra day, but we realized there would be nothing much to do. It was, after all, a very small if prosperous and attractive place. Today we rode from Tinguindin to Tangancicuaro. For pure cycling, this was the best  and also perhaps the worst  day of the tour. Heading north from Tinguindin, we stopped first at a little market square in some village or other and had good liquados  fresh squeezed orange juice, a banana, and a raw egg, all frothed in a blender. 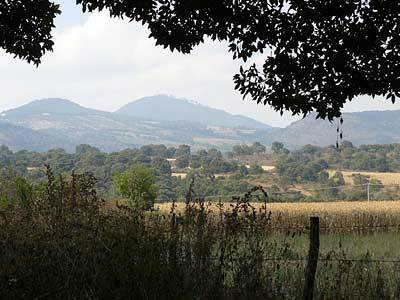 Then, in another half hour or so, just north of a little town called La Cantera, we decided to head east-southeast on an unmarked road. 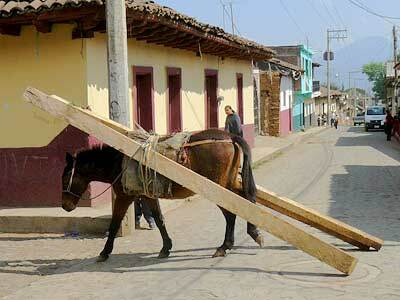 A couple of people at the intersection told us it was the better way to go to Tanguancicuaro. It was! Again, we had to climb and climb, a couple of thousand feet anyway, but the road was very quiet, nearly litter-free, with views that got better and better. 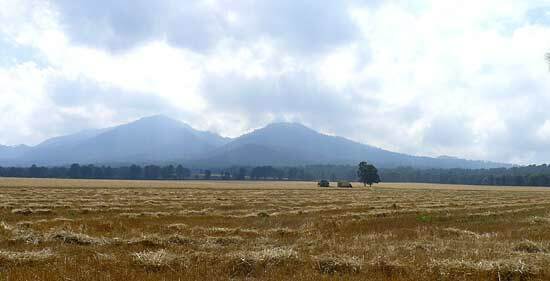 We climbed into high farming country, many dairy farms, fields of corn and grain on gentle slopes, bigger tree-clad hills in the distance, all quite green, more like parts of Vermont than anyplace we've seen in Mexico. Being so high, the air was clear but it wasn't too hot. Just a beautiful ride. But then there was the bad part. At the village of Patamban, the beautiful road gave out for a while in favor of dirt and rough cobblestones. Good road did resume soon, much of it downhill after the village, and on a turn at an intersection, Barbara hit a patch of gravel and crashed. She had nasty abrasions and bruises. She was hurting. After some cleaning and bandaging, we continued to Tangancicuaro, fortunately not far away, and took the first hotel we found. It was by the gate of the (overrated) national park. 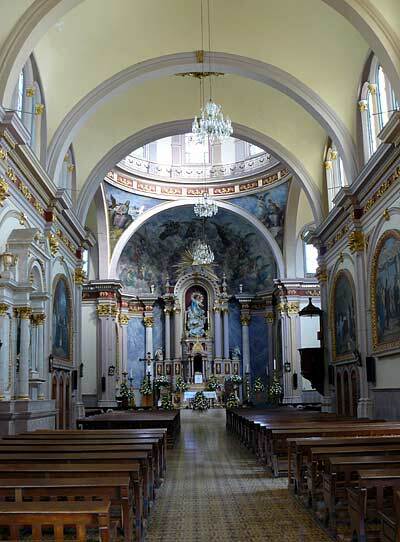 We were led to it by a nice Mexican family who drove slowly enough through the complicated town to show us the way. For the first time since Mexico City, we paid a relatively hefty price (about $45 U.S.) at Casa del Lago (left) for a big, clean and comfortable room with all the extras  high-speed, in-room internet, cable TV, very big bath and shower, a pool that we didn't use, etc. It was a question of getting Barbara as comfortable as possible, as soon as possible. The friendly, English-speaking manager came up with a bag of ice, enough to deal with Barbara's bruises and also to chill her big glass of Canadian Club. By evening she was ready to go for a walk by the lake, and we had a decent dinner in the hotel restaurant. Despite Barbara's wounds, she wanted to push on the next day. We left Tangancicuaro rather late, taking our time in the room and also talking for a while to some Americans who moved to Mexico years ago and became Mexican citizens. One of them ran a gallery near Guadalajara, and they were on their way to see a pottery show at one of the indian villages in the mountains. Again, our day's ride was short, but very long on climbing. The photo of Barbara's GPS says it all. Though the start of the ride was cool, we had to climb from about 5,300 feet to just under 8,000 feet, and it was damned warm near the end. Before 2 p.m. we stopped at a little roadside café and had a full dinner and fairly long rest. Fortunately, there wasn't too much more climbing  though some of it was still difficult  before we began a long descent to Zacapu, where we aimed to spend the night. Someone we met earlier on the trip told us that cycling was popular in Zacapu. On the way to town we noticed two cyclists tricked out in all the proper gear blazing along on road bikes. In the evening, when we went for a walk, we passed two bike shops and three spinning clubs in just a few blocks, and we saw more performance cyclists on the road when we left the next morning. How could that be? we wondered. 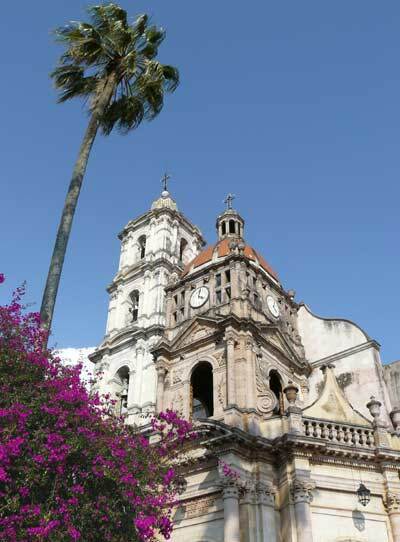 Anyway, after our big meal in Zacapu, we just strolled at dusk and had snacks on the plaza. 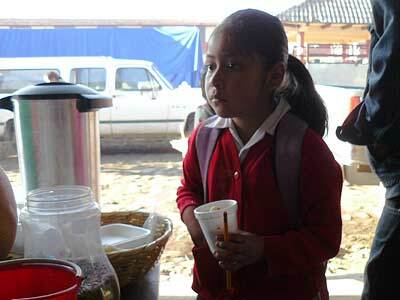 Real health food  a milk shake, ice cream, and a bag of just-sliced-and-cooked potato chips from a street vendor. Tomorrow, Thursday the 29th, we'll be heading back to Morelia, the end of this loop, though it's not certain we'll go the entire way in one day. We shall see. 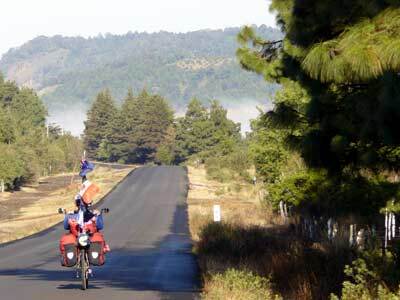 The next day we rode to Morelia, again with more climbing than we'd expected: up to nearly 8,000 feet  twice! The photo of Barbara's GPS says it all! There was a substantial climb before Quiroga, and then a big descent that we'd pretty much forgotten; it took us down at least a thousand feet, probably much more. 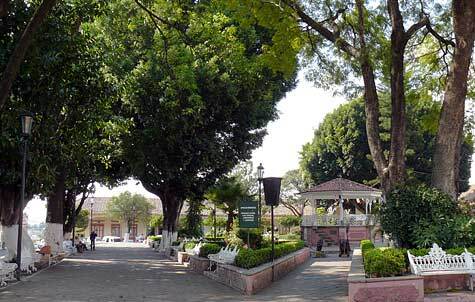 Around 11:30 a.m., when we arrived in Quiroga, we stopped at a nice little sidewalk place for a couple of huaraches. On our way again by noon, we thought we had it made. But we'd forgotten again. 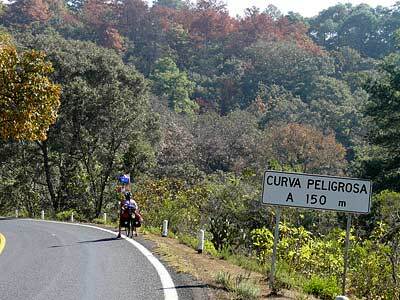 Big climbs, back to 7,950 feet before the final long descent into Morelia. 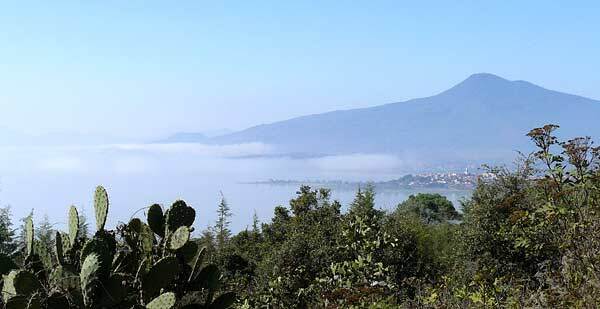 I took quite a few pictures this day on the climbs, including one of Lago Patzcuaro nearly covered with low-lying clouds. 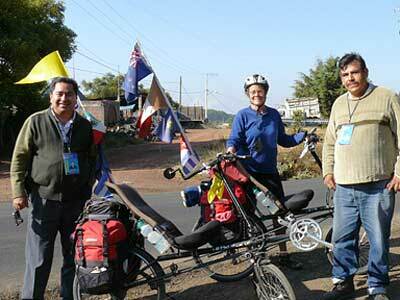 Barbara zoomed through the traffic entering Morelia like a bike messenger  I was impressed! It was only later that she said she'd been nervous and had hated it. Why cycle at such fearless speed? Because I wanted to get it over with, she said. 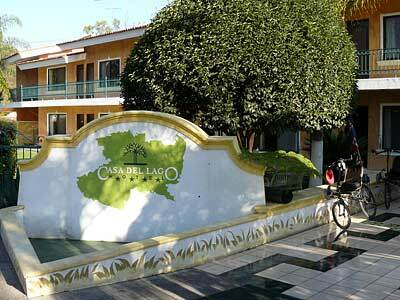 Anyway, we reached Hotel Allende around 4 p.m., enough time to settle in. Steve, the chatty Canadian guy, was still there, teaching English as a volunteer and working on whatever kind of high-end computer programming he does. He told us where to find a roast chicken, which we did, buying also some salad and rice and beans  ending up with a ridiculously huge meal for 65 pesos. We could have fed a family of five.